Hardwood Hype: Plays of the Week – The Most Kevin Durant Conversation Ever and LeBron Helping... The Cavs?! Plays of the Week – The Most Kevin Durant Conversation Ever and LeBron Helping... The Cavs?! Forget the singular skill set, the silky smooth release that looks the same from 40 feet as it does from 20 and “business tats,” this is why we all love Kevin Durant. Whomever you root for, one day your team will have to rebuild. When this inevitably happens, do not forget to recalibrate. The AAPL of the podcasting world, the Basketball Jones blew away the estimates in their latest quarterly report, which features a firm-but-fair assessment of one Mike Bibby. Meanwhile, at Forum Blue & Gold, Darius provided a comprehensive look at the Lakers’ sputtering offense – the good, the bad and the possibilities. Last season, Blake Griffin sent shockwaves of childlike exuberance through the NBA. Now, as Kevin Arnovitz beautifully explains, flanked by Chris Paul, burdened by expectation and no longer allowed to coast solely on highlight fodder, Griffin has entered the next phase of his journey toward icon status. I guess there really is only one first time. At A Wolf Among Wolves, Myles Brown examined the Timberwolves’ handling of Kevin Love’s extension – taking management to task for deliberately slighting the second best player in franchise history (and a superstar that actually wants to stay in Minneapolis!) and leaving the fan base too unnerved to be euphoric. At The Gothic Ginobili, with the Eastern Conference in the books, Aaron McGuire filled out his Western Conference All-Star roster for the first quarter of the season, and in the process provided an excellent breakdowns of the battles for the starting lead guard and center spots. 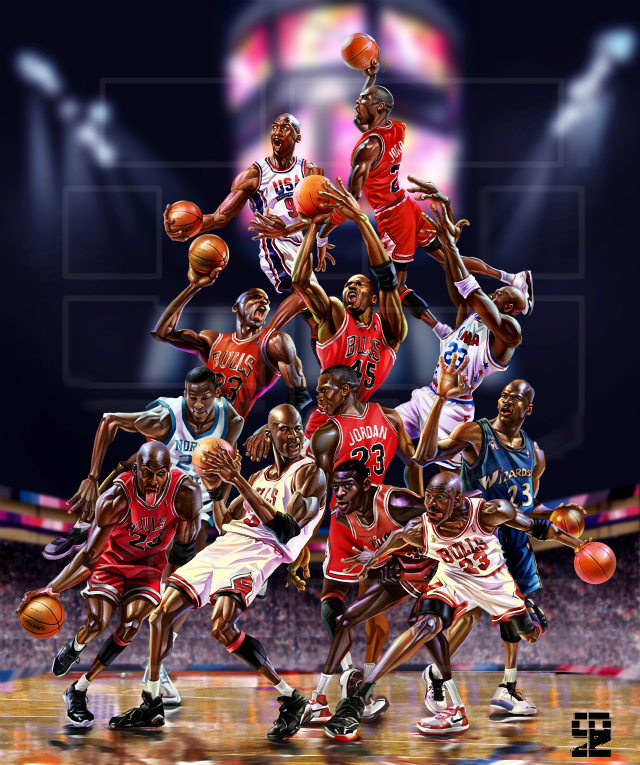 Ever wanted a one-stop shop for every iteration of Michael Jordan? Thanks to this absolutely gorgeous piece on Hooped Up, you’ve now got it. Despite boasting one of the deepest and most versatile rosters in the NBA, the Portland Trailblazers’ front office faces a major challenge. Rather than gearing up for a sustained run of contention in the West, the organization must focus on the impact of each move in order to avoid an unwelcome domino effect. At Welcome to Loud City, J.A. Sherman provided a great analysis of the Thunder’s pick-and-roll offense – which skews rather heavily in one direction. Many are eager to lambast LeBron James for his perceived selfishness and lack of leadership. I’m guessing Kryie Irving and Tristan Thompson are not among them. The Warriors’ bloggerati are one the same page. On Warriors World Ethan Sherwood Strauss rejected the franchise’s plodding journey toward NBA purgatory, while Evanz of Golden State of Mind reached into the archive to express the same sentiment. Finally, in the wake of Danilo Gallinari’s triumphant return to MSG, Roundball Mining Company caught up with Knickerblogger’s John Kenney, who provided some brutally honest commentary on the deal for ‘Melo and state of the Knicks’ union.